Today, I will be reviewing my current moisturizer: Mizon’s Snail Recovery Gel Cream. 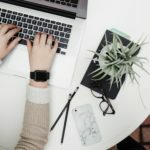 After my issues with Cerave PM, I searched reddit and various Asian skincare blogs for other product options. I ultimately narrowed it down to this moisturizer because of its light consistency, generous snail mucin content, soothing properties, and hygienic squeeze tube bottle. When I started shopping around for a new moisturizer, one requirement was that it had to have snail secretion filtrate. Also known as snail mucin or snail slime, this substance is filled with nutrients that smooth skin texture, hydrate skin, and reduce fine lines and wrinkles. The Mizon Snail Recovery Gel contains a generous amount of snail secretion filtrate – 74% according to the packaging. 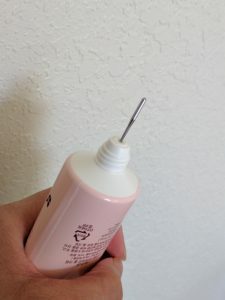 One thing that really appeals to me about the Mizon Snail Recovery Gel Cream is its cute pink squeeze tube. Unlike plastic jars which can be messy and unsanitary, the squeeze tube allows you to dispense just the right amount of product, preventing contamination and potential waste. Another benefit of this tube is that it’s travel friendly and easy to toss into my purse or travel bag with no worries. I should, however, discuss one issue I did have with the squeeze tube. Initially, I couldn’t get any gel out despite squeezing as hard as I could. I eventually grabbed a sterilized needle and stuck it in the tubes’s opening to make sure it wasn’t plugged. The tube deflated and the product was no longer stuck. If you’re having issues getting the gel out of the tube, check to make sure it isn’t because of a clogged opening! 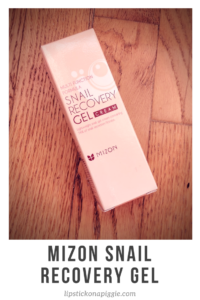 The Mizon Snail Recovery Gel Cream is a light moisturizer with emollient and occlusive properties. In term of consistency, this light gel is smooth and easily absorbed by the skin without leaving any oily residue. This is a major plus for me, as I was quite concerned about breakouts and oilier skin as a result of the olive oil. 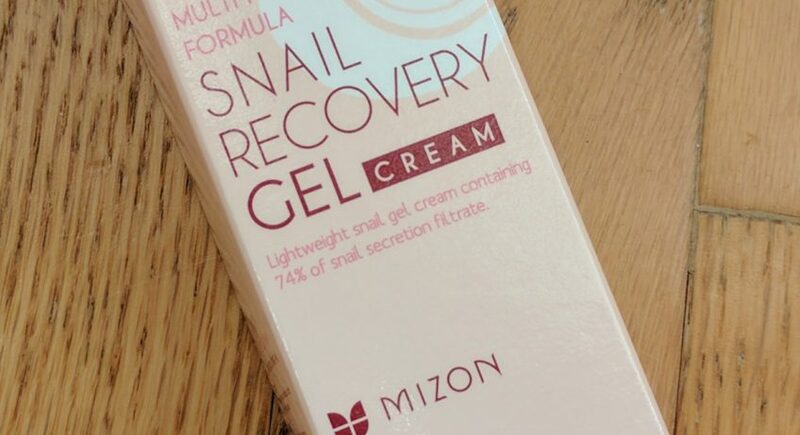 A tube of Mizon Snail Recovery Gel Cream contains 45 ml (1.52 fl.oz.) of product. A little bit goes a long way, and in one month I’ve only gone through about 1/3 of a tube using it twice a day. This product provides adequate hydration but unlike Cerave PM does not leave an oil slick on my skin by the end of the day. However, I am thinking of adding a nighttime moisturizer to my routine as the winter weather has been especially drying to my face. If you have dry skin, you might want to look for an additional moisturizing product to use on top of this. I’ve been using this product for month and have not noticed any major changes to my hyperpigmentation or scarring. However, my face no longer has patches of dry, peeling skin which I often get in the winter. 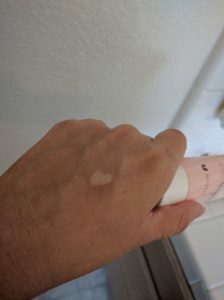 In addition, I’ve noticed that my skin has been less oilier at the end of the day. Who would have thought that a product with olive oil could actually help make my skin less oily? Most importantly, this product has not caused any breakouts in the one month I’ve been using it. This elevates it to HG (holy grail) status for me! The Mizon Snail Recovery Gel Cream is a solid moisturizer which does not cause me breakouts or oilier skin. However, it does have a light consistency, so those of you with drier skin may want to consider a second moisturizer, or save this for hot summer months. Unless I find a better moisturizer, I plan on using this product for as long as Mizon makes it! It’s performance, coupled with the affordable price tag, snail content, portability, and hygienic packaging easily makes this an HG item for me. 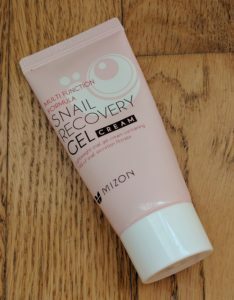 I purchased a pack of two tubes from Amazon: Mizon Snail Recovery Gel Cream.